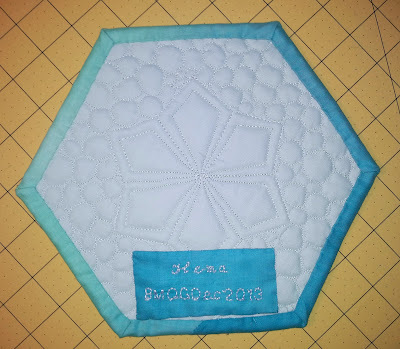 For our BMQG December meeting we all have to bring something quilty stuff for gift exchange. I decided to make this little mug rug, since I knew I will be short of time and wanted to pick something which I can finish before the meeting. This is probably between 6 to 7 inch finished hexagon. 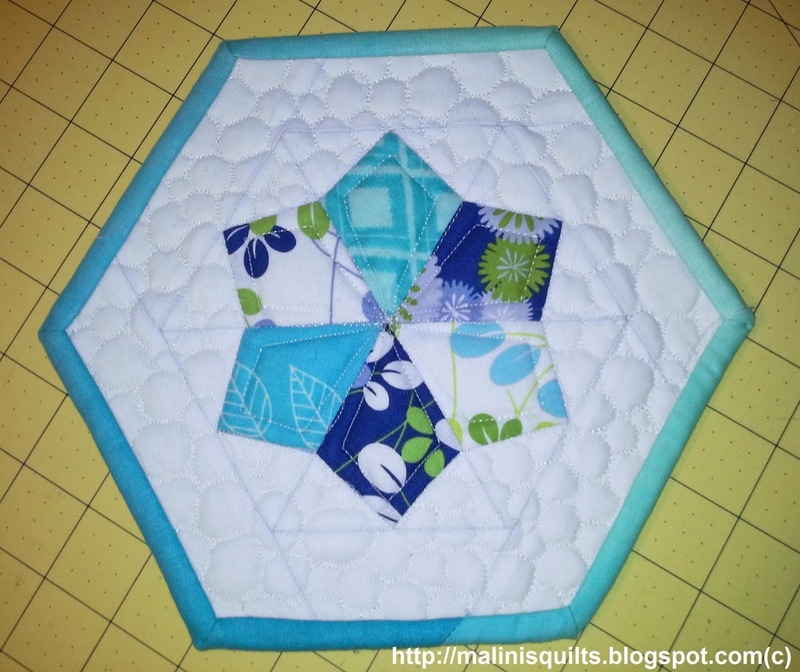 Also this was my first attempt at finishing the little quilt with hexagon binding. I did have to fiddle with closing the binding right, took me a while. The binding was machine stitched to the front and hand stitched at the back. This little thing took me little over 4 hours to make. Either I am very slow or detailed oriented. 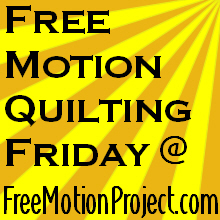 Now linking up to Leah Day's FMQ Friday. I will be back again with another post on the gift I got to grab. Yes, I used the word grab since it was a Yankee swap and I couldn't resist the gift made by a special friend. It was a steal for sure. Also linking up to Hexie Friday @ A Quilting Reader's Garden. This mug rug may be small but it is impeccable - I don't know how you bound something so tiny so neatly. 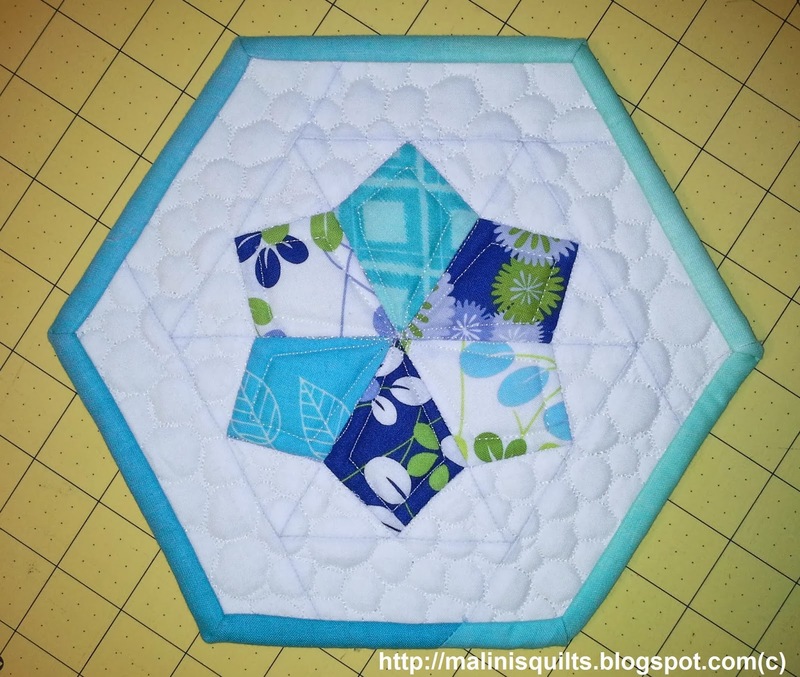 Nice looking hexie mug rug! The binding looks good. This came out great. I especially love the ombre binding. What a darling mug rug in one of my favorite shapes. Like everything about it: fabric, quilting - I would have grab it too if I'd been in that swap. Malini, I invite you to link your hexie project to Hexie Friday. Linky still open. Merry Christmas!